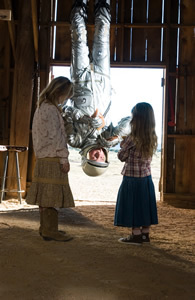 The Astronaut Farmer has an improbable back-story that emerges as the plot trudges forward. It stars Billy Bob Thornton as Charles Farmer, the father, husband, and washed-up astronaut-in-training of the film’s title. Farmer’s own father had committed suicide after a life of failure and insurmountable debt. Somehow, Charles’ quixotic quest (or lunatic’s delusion) drives him relentlessly, seemingly destroying his own family, as he seeks, not once but twice, to recreate John Glenn’s original Mercury-mission single orbit around the earth in 1962. If the audience can swallow this tall tale, it becomes easier to believe a retired NASA man can buy 10,000 pounds of rocket fuel on credit, not to mention shooting across the West Texas desert in a rocket and living to try it again. At heart, Polish is telling a modern-day fairy tale in contemporary nostalgic language. This is a children’s film, strictly for kids only. The plot moves very slowly, repeats itself so much that at one point, it appears as if the original story line had been re-edited to accommodate a time-protracting plot extension. The plot pauses far too frequently (every few minutes) to remind viewers it is all about American family values. Virginia Madsen delivers an endearing, almost life-like performance as Audie, an endlessly patient, loyal wife and loving mother. Wherefore the unusual name Audie for the mother? It seems to allude to Audie Murphy, the World War II hero-turned-Hollywood actor, whose films (for adults) now seem like potboilers mired in the same treacly homespun American virtues this film is cashing in on. Audie and Charles are raising three fine all-American kids on the family farm in Texas to be the homegrown mission control team for dad’s crackpot obsession. The film was shot in New Mexico. (Note: Texans, like Californians and others living west of the Mississippi, usually have ranches, not farms.) The siblings include two young girls Stanley (Jasper Polish) and Sunshine (Logan Polish) (presumably director Polish’s own daughters), big brother-substitute father figure Shepard (Max Thieriot), and grandfather Hal (Bruce Dern), who dies on cue, for maximum weepy effect, and looks distressingly like a walking corpse from the moment he appears on screen. Set designs suggest a timelessly mid-century fantasy America, although purportedly set in the present, paranoid post-9/11 era. A solidly square table phone, grandpa on wooden crutches, and other details (an irritating mix of warm woods and mid-century plastic, suggesting the typical American home circa 1962) stress this dreamily nostalgic vision of an earlier high-tech era. The bad guys, all black Cadillac SUV-driving FBI agents, Men in Black as parodied by American Dad, serve a typically early-sixties screwball comedic role. Although set in the same recent mythic past, The Farmer Astronaut does not come within a country mile of the heart-warming nostalgia of Pixar Studios’ Cars. It could be portending the decline and fall of Hollywood, except that it is so unexceptionally bad, and unexceptionally typical of the studio fare right now. Cashing in on big names by throwing such a small bone, adding a few cheap special effects and patriotic heart tugs, does not justify paying the current multiplex fee, over $10 a pop per adult (not counting the visit to the concession stand).